NOAA’s GOES-R looks at a bruised continent yesterday. Smoke from fires in the west. 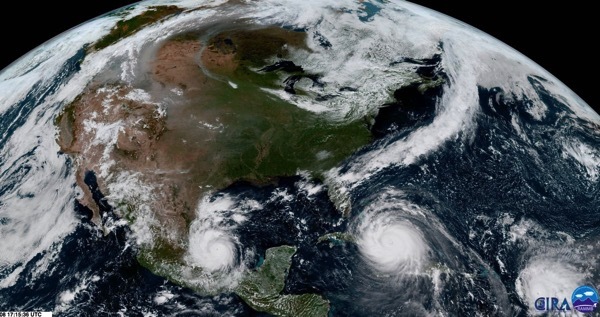 3 hurricanes in the east. Not shown: earthquake in Mexico. DPRK missiles. Unidentified USAF aircraft crashes on the Nevada Test Range. Possible classified project? “Inside Superstar Machine, Which Ex-Members Say Is a Cult Preying on New York’s Creative Women.” And inevitably, “Lawyer who sued Gawker and Techdirt has a new target: Jezebel“. Has the Voynich Manuscript finally been decoded? Magic 8-Ball says, outlook good. Solid detective work in tracking down faulty eclipse glasses. This entry was posted in Aviation, Esoteric Studies, High Weirdness, Links, The Current Situation. Bookmark the permalink.